Mr Wang Wei is currently the bass trombonist of the Singapore Symphony Orchestra. He previously was the bass trombonist of the China National Centre for the Performing Arts Orchestra. He was also the guest player of the Boston Pops and the Boston Philharmonic Orchestra, just to name a few. Do not miss this chance as Mr Wang Wei goes through and fine tunes the current orchestra repertoire while also sharing tips and tricks to improve your playing. Trombonist or not, this is definitely a chance not to be missed. As limited slots are available, we will be opening the masterclass selectively to the public with priority for members of the Kids’ Philharmonic@sg. Interested members of the public will have to undergo a video audition. For more information you may drop us an email enquiry and we will respond as soon as we can. Featuring familiar favorites such as Bohemian Rhapsody by Queen, Perfect, Havana, Africa and much more, be amazed as the KPO Stars are here to rock the stage once again with a twist on our favorite music! Admission is free! Everyone has watched Superman or Star Wars as a child. Clark Kent was the hero we loved in superman, Luke Skywalker was our favourite hero in Star Wars, and who could forget about our favourite wizard Harry Potter! 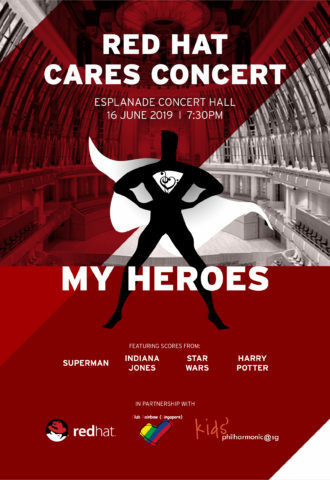 However as we listen to the nostalgic soundtracks playing for us on stage this june 16th, we are also being heroes ourselves as all ticket sales will go towards the Red Hat Charity! Enjoy a concert while doing something charitable. Come and be heroes with us! The Kids’ philharmonic@sg is bringing world class string soloists to our community, performing for us at Our Tampines Hub, such as the prize winner of the Tchaikovsky competition Chen Xi, Head of violin studies of the Yong Siew Toh conservatory of Music Zuo Jun, former concert master of the Singapore Symphony Orchestra Alexander Souptel and much more, this is an opportunity not one to be missed!